It fits amazing. It works amazing. It makes you look amazing. It feels UH-MAY-ZING. There’s nothing like finding the perfect swimsuit. If you’re anything like me, the comfort and appearance of your swimsuit affects your confidence in the pool. And if the suit makes you swim faster too (Speedo…), it’s worth all the gold in the sea! But how do you keep that, “look good, swim good” feeling for as long as you can? How do you preserve your secret weapon? The lifespan of your swimsuit largely depends on the fabric content and the quality of production. 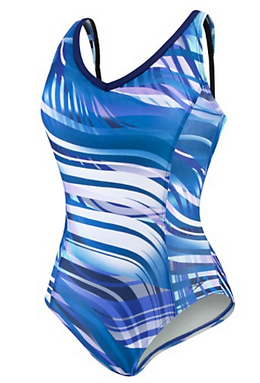 Choosing a swimsuit with more stretch in it will aid in preserving the shape over time. As a rule of thumb, pick a suit with a higher percentage of spandex. If you can’t avoid getting your suit warm from time to time (swimming in the sun), polyester blends are better at withstanding heat. Although extreme heat is still a good way to murder your suit. More on that later…. And choose a brand you trust! Higher quality swimsuits are chlorine resistant. They are not as easily broken down by the corrosiveness of pool chemicals, and they are typically stitched really well. Chlorine will still kill them eventually. But at the pace of stage one cancer as opposed to falling off a skyscraper. Quick Tip: It should list on the manufacturer’s tag inside whether or not it’s chlorine resistant. If you just bought a new swimsuit, consider prepping it before wearing it. It might smell weird, but that will only be temporary. And the benefit outweighs the cost. Wash your suit ASAP. Even just a quick rinse is better than nothing. Use fresh water. You don’t want to give any bacteria a fighting chance. Never wash the swimsuit in the washing machine. The washing machine & dryer break down the Lycra & can ruin the bra cups or other delicate parts. Always wash by hand with a mild soap. Because plain water will not rinse out the chlorine or salt water. Even if you’ve only been sunbathing. Your skin’s oils and sunblock can damage the fabric too. I personally use baby shampoo to wash my swimsuit because it’s delicate and smells great. Never dry it in the dryer or out in the sun. Any kind of heated drying process is forbidden. So, dryers and the sun are out. Not only will heat deteriorate the spandex/Lycra (stretchy stuff) and decrease the elasticity, it will also fade your suit’s vibrant colors. Try not to wring out all of the water! It can harm the elastic fibers and stretch out your suit in certain places. 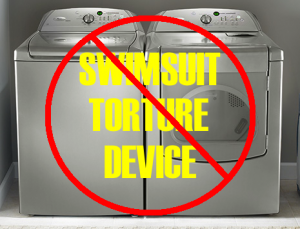 And consider rotating swimsuits so that you have time to wash and dry one completely before wearing it again. Elastic needs time to bounce back to its original shape. Hang your suit up inside to dry. Or in a nice shady spot, away from the sun. The extreme heat plus the chemicals = adios swimsuit. It will be a quick demise. The high temp and the bromine will fade and stretch your suit out faster than anything else. Definitely opt for chlorine resistant swimsuits when hot-tubbing. Or, even better, choose a suit that is 100% polyester (this one has the highest probability of retaining quality). Or, you could do the exact opposite and set aside a crappy old suit specifically for this purpose (one that you don’t care about ruining). Kind of like wearing old clothes when you paint your walls. We’ve all folded our suit in a towel at one point or another to keep it from dripping all over. But think for one minute what that’s probably doing to your suit… it’s a gross visualization. It’s “..like marinating and heating the poor thing.” Aside from the consequences of heat, mold is a factor! On my honeymoon, we had to pack all of our stuff up in a hurry. I didn’t want to get everything in my suitcase wet. But my one-piece wasn’t dry yet. So, I put it in a plastic baggie. It stayed in there through customs, a taxi ride, airport security, and a flight across the country. Needless to say, mold invaded my suit. Gross. Concrete is slip resistant. Which is usually good. You don’t want to fall on the pool deck and smash your teeth in (like my mom did when she was a kid). Rough surfaces snag and tear material. So if you think that pilling, snagging, running fabric is attractive, go for it! But don’t be surprised when you swan dive and the crotch of your suit rips open. Try to live that one down! How do you preserve your favorite swimsuit? How do you keep the colors bright? Do you know of any special swimwear detergent? Tell us all the sneaky tricks!